For such varied enclosure systems as fenestration, curtain walls, and rainscreens made with engineered bamboo products offer a few inherent advantages. While the engineered bamboo functions in ways similar to hardwoods and can be worked with standard carpentry tools, it can be more sustainably sourced, and it tends to have very minimal shrinkage and better dimensional stability. Engineered bamboo products have natural antimicrobial properties so they resist moisture build-up and through unique processing methods can help prevent decay or rot from the core of the materials. Bamboo's high silica content acts as a natural insect deterrent. Engineered bamboo tends to have a slightly higher density than common hardwoods, which increases its capacity to be used in applications where traditional hardwoods would perform poorly. These products also offer aesthetic attributes where other materials used in these applications need to be covered up by additional building materials to achieve a certain look wanted by the architect and designer. Bamboo provides a unique aesthetic that can be admired by the end user. The unique look of engineered laminated bamboo is becoming more accepted and appreciated by today’s architects and designers looking for a natural product that does not need to be covered up by additional building materials which help reduce overall cost of time and labor in projects. In summary, SBPs can be described as similar to wood glulams but with more functional consistency and better dimensional stability, all things being equal. SBPs also can provide reduction in overall cost for projects by reducing the need to utilize additional building materials to cover up the exposed engineered bamboo materials. have mechanical properties comparable to hardwoods. exhibit compressive strengths greater than softwoods. 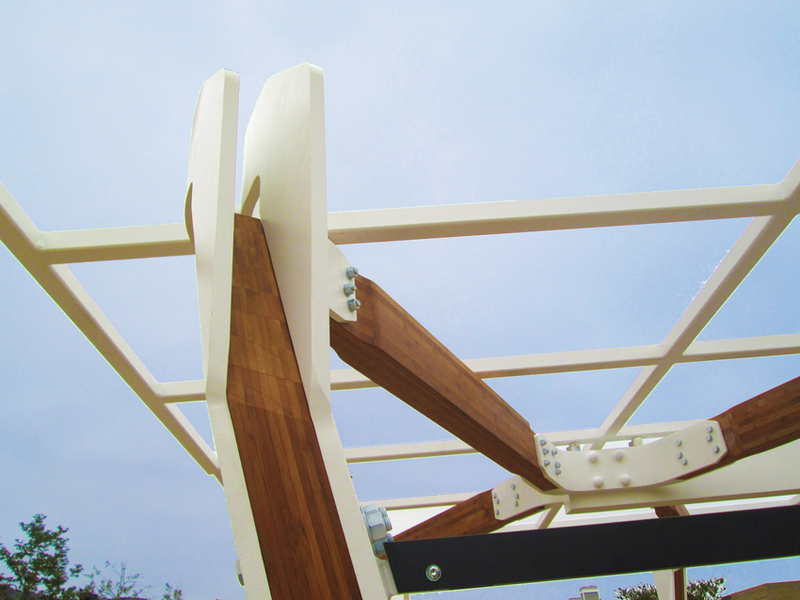 have tensile strengths greater than other wood species. are more dimensional stable in moisture and temperature changes when compared to timber-based product (dependent on wood species). In order to allow for system modularity, which translates into efficient architectural integration, SBPs are available as standard shapes, including beams, glue-laminated (glulam) members, exposed trusses and members, as well as hybrid assemblies in combination with cold-formed steel joists. Similar to timber glulams, engineered bamboo products are available through catalogs of modular structural components, which can be pre-assembled and serve as elements of pre-engineered construction systems. To include wood joinery techniques and structural connections, these members are fitted with steel plates and clips as well as pre-drilled to allow for efficient jobsite connection. Structural glazing: This comes in the form of curtain wall members, storefront system components, and system and installation integrated as a thermally high-performance hybrid aluminum/SBP. Structural bamboo products (SBPs):These include fabricated common dimensional components, glulam beams, and hybrid structural applications. 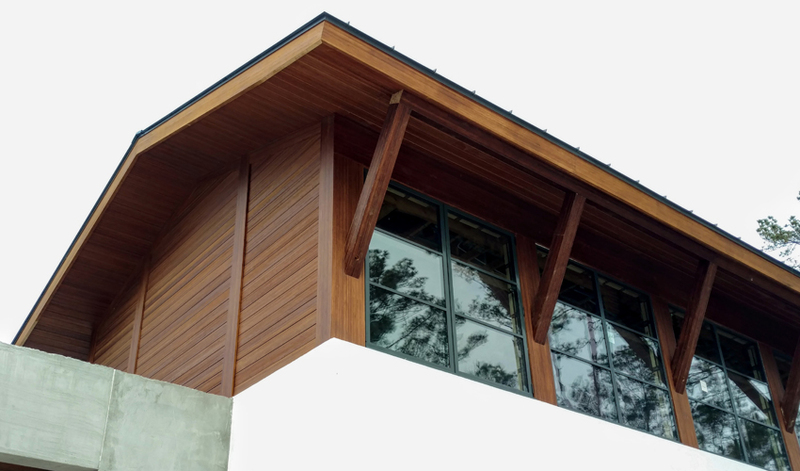 Manufacturers and glu-lam fabricators can offer consulting, shop drawings, structural system analysis, engineering, and installation support for architects working with engineered bamboo. Enclosure and exterior products:These include window and door components that are integrated into glazing solutions to provide efficiency and continuity within turnkey glazing systems. Rainscreen systems include exterior wall/ceiling cladding and siding solutions, soffit, fascia, exterior products, including awnings, site furnishings, and playground equipment, bollards, trellises, and more. High-performance, sustainable buildings: In these structural and nonstructural applications, SBPs may contribute to as many as five LEED credits, depending on the application and project details.